We are offering False Flooring to our client's. 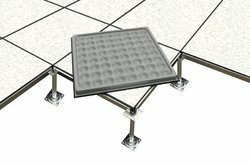 A raised floor (also raised flooring, access floor(ing) or raised access computer floor) provides an elevated structural floor above a solid substrate (often a concrete slab) to create a hidden void for the passage of mechanical and electrical services. #CalciumSulphatePanel is available with Various Top Finishes Like #HPL#PVC #Vinyl #Linoleum #Timber #Granite #CeramicTile etc. We are providing Bare Finished Raised Flooring system. 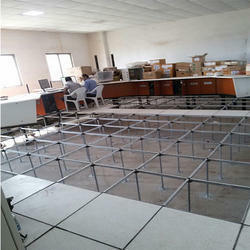 We are counted among the leading industries, engaged in rendering False Flooring material to our clients. Being a leading firm in this industry, we are deeply engaged in offering a high-quality range of False Flooring.